1.Dark green color, easy to blend in to patio or yard. 2.Three holes in right size in the bottom for draining. 3.Handles were perfect and sturdy. 4.A very different from other similar grow bags: there's an unique merit as for this product, you can observe the growth of roots and seeds from the flap. 1.If you don't have ground space, this is perfect for container gardening on deck. Makes a great container garden, and portable too. 2.These planter bags sit neatly out of the way in a spot that gets a lot of afternoon sun. 3.Your husband planted seed potatoes, and you, just planted tomato seed, then there comes harvest, enjoy your honey! 4.Move your plants to warm in winter and cool in summer, have not any rascally animal bothering your plants. When the harvest season nears, you would found that the potato grow bags have deserve all. 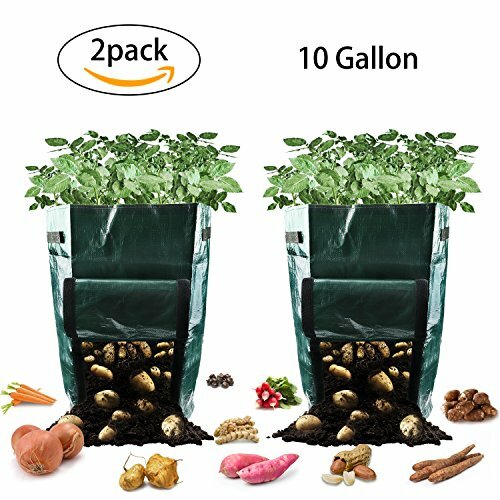 ❤COLLAPSIBLE AND VARIABLE: All the potato bags you get are 10 gallons, affordable for more than 10 seeds, enough room for most kinds of vegetables and fruits, not only potato but also carrot, tomato, Onion, just rolled the bag down to change the size of the bags, also to get some sunlight. ❤BREATHBALE AND VISIBLE: Update design garden planter bags with three drainage holes to make the roots breath and grow, harvesting window on the side to get gains, or decided to open or according to the wet air, this potato bags' flap eliminates the need to remove the plant and soil, and guide your children to observe the plants' growing process, any time open the door meet a harvest! ❤DURABLE AND REUSABLE: High-quality and sturdy material reusable for time-after-time and season-after-season, add water and have it sink in, solid, yet lightweight and waterproof, put your fruits when no use, or just folded potato bags to store up for taking less space. ❤FUNCTIONAL AND REMOVABLE: Lifting handles sewn very tightly for easy moving around without soil fall or leak, no worry about no-space, no-sun, snow ground or any terrible weather and bad soil, garden planter bags are suitable for indoor and outdoor planting, perfect size for balcony and garden, plant plants, greenhouse planting, flower planting, indoor gardens, farms, potted plants, nursery outdoor. ❤ECO-FRIENDLY AND BPA FREE: Execute to international environmental standards, these potato pots are non-toxic and biodegradable, wholesome for plants' breath and growing procession, so the plants will feature healthy roots and thick stems, say no to disposable enclosed potato planter.